Virginia Main Street blog readers logged on in record number to select their favorite Main Street eateries. In just over a month nearly 59,000 votes were cast for one of 25 restaurants. Nearly half of the votes were for South Boston’s BISTRO 1888. And it’s a worthy top choice. The Bistro demonstrates what first-class food and downtown reinvestment can do for a community. Since executive chef and co-owner Margaret Moorefield moved back east from Portland, Oregon and established the eatery with co-owner Barbara Cage, South Boston has been a dining destination. 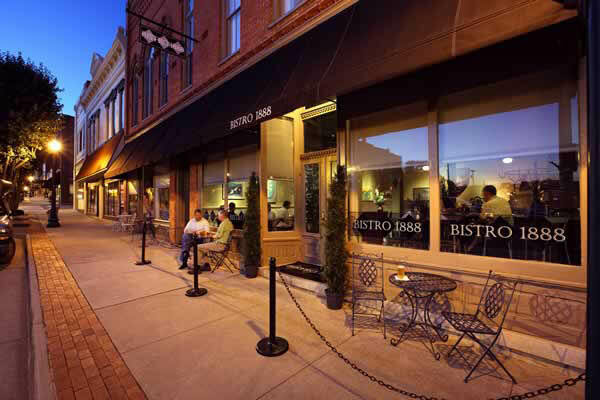 Read reviews of the American Automobile Association three-diamond rated BISTRO 1888 here. The second top vote getter is centered in the arts and cultural district in Old Town Manassas. Okra’s Louisiana Bistro owner Charles Gilliam has witnessed a lot of changes to the area since he founded the restaurant in 1998. While the district keeps getting livelier, the food and service at Okra’s remains consistently good. The creamy stone ground grits are good enough to eat on their own. Thanks for voting. Thanks for dining downtown.